A view from the other side of this attractive Zen style gravel garden with two storey pagoda in the distance. From Kanyou Zen Temple in Kano, Yamaguchi Prefecture. The Zen Garden represents the cosmos I have heard it said. 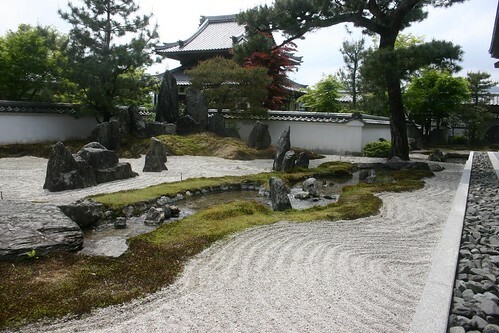 It seems to me that many a Zen garden look like geographies in miniature so that looking at one for a while ones mind starts to play tricks, and the gravel looks like the sea and the rocks like, or patches of grass like islands. The significance of this is, in my opion, like the Kanon bodhisattva statue that appears to be in motion even though it is stationary, to encourage the viewer to realise that scale and motion are in the mind of the beholder. Or that ultimately everything is in the mind of the beholder, and that the data, the pure experience is "mu" (chaos, nothing, Buddha nature) .